Ellison S. Onizuka, was one of the three mission specialists aboard the Challenger STS-51L. He was born in Kealakekua, Kona, Hawaii, on June 24, 1946, of Japanese-American parents. Mr. Onizuka attended the University of Colorado, receiving B.S. and M.S. degrees in engineering in June and December 1969, respectively. While at the university he married Lorna Leido Yoshida of Hawaii, and the couple eventually had two children. He also participated in the Air Force R.O.T.C. program, leading to a commission in January 1970. 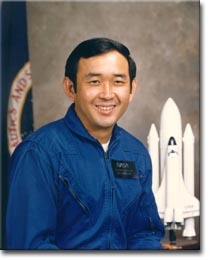 Onizuka served on active duty with the Air Force until January 1978 when he was selected as a NASA astronaut. With the Air Force in the early 1970s he was an aerospace flight test engineer at the Sacramento Air Logistics Center. After July 1975 he was assigned to the Air Force Flight Test Center at Edwards Air Force Base, California, as squadron flight test officer and later as chief of the engineering support section. When Onizuka was selected for the astronaut corps he entered into a one year training program and then became eligible for assignments as a mission specialist on future Space Shuttle flights. He worked on orbiter test and checkout teams and launch support crews at the Kennedy Space Center for the first two Shuttle missions and became the first Asian American to reach space and the first person of Japanese ancestry to reach space. Since he was an Air Force officer on detached duty with NASA, Onizuka was a logical choice to serve on the first dedicated Department of Defense classified mission. He was a mission specialist on STS-51C, taking place 24-27 Jan. 1985 on the Discovery orbiter. 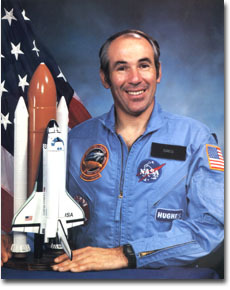 The Challenger flight was his second Shuttle mission. Read even more about Ellison – A Visionary Hero. 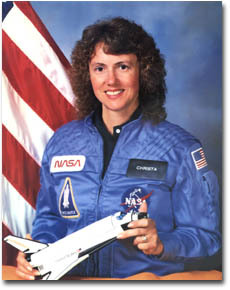 Christa McAuliffe was selected from among more than 11,000 applicants from the education profession for entrance into the astronaut ranks, to become the first teacher to fly in space. McAuliffe was born on September 2, 1948, the oldest child of Edward and Grace Corrigan. McAuliffe attended Framingham State College in her hometown, graduating in 1970. A few weeks later she married her longstanding boyfriend, Steven McAuliffe, and they moved to the Washington, D.C. metropolitan area so Steven could attend Georgetown Law School. She took a job teaching in the secondary schools, specializing in American history and social studies. They stayed in the Washington area for the next eight years, she teaching and completing an M.A. from Bowie State University, in Maryland. They moved to Concord, New Hampshire, in 1978 when Steven accepted a job as an assistant to the state attorney general. Christa took a teaching post at Concord High School in 1982, and in 1984 learned about NASA’s efforts to locate an educator to fly on the Shuttle. The intent was to find a gifted teacher who could communicate with students from space. NASA selected McAuliffe for this position in the summer of 1984 and in the fall she took a year-long leave of absence from teaching, during which time NASA would pay her salary, and trained for an early 1986 Shuttle mission. She had an immediate rapport with the media, and the teacher in space program received tremendous popular attention as a result. It is in part because of the excitement over McAuliffe’s presence on the Challenger that the accident had such a significant impact on the nation. Washington, and graduated from the public high school in Auburn, Washington, in 1957. Mr. Scobee then enlisted in the U.S. Air Force, training as a reciprocating engine mechanic but longing to fly. He took night courses and in 1965 completed a B.S. degree in Aerospace Engineering from the University of Arizona. This made it possible for Scobee to receive an officer’s commission and enter the Air Force pilot training program. He received his pilot’s wings in 1966 and began a series of flying assignments with the Air Force, including a combat tour in Vietnam. Scobee also married June Kent of San Antonio, Texas, and they had two children, Kathie R. and Richard W., in the early 1960s. He attended the USAF Aerospace Research Pilot School at Edwards Air Force Base, California, in 1972 and thereafter was involved in several test programs. As an Air Force test pilot Scobee flew more than 45 types of aircraft, logging more than 6,500 hours of flight time. In 1978 Scobee entered NASA’s astronaut corps and was the pilot of STS-41C, the fifth orbital flight of the Challenger spacecraft, launching from Kennedy Space Center, Florida, on April 6, 1984. During this sevenday mission the crew successfully retrieved and repaired the ailing Solar Maximum Satellite and returned it to orbit. This was an enormously important mission, because it demonstrated the capability that NASA had long said existed with the Space Shuttle to repair satellites in orbit. 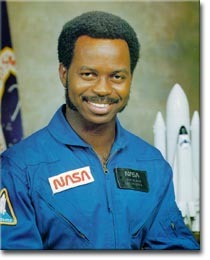 Ronald E. McNair was one of three mission specialists aboard Challenger. Born on October 21, 1950 in Lake City, South Carolina, McNair was the son of Carl C. McNair, Sr., and Pearl M. McNair. Mr. McNair achieved early success in the segregated public schools he attended as both a student and an athlete. Valedictorian of his high school class, he attended North Carolina A&T State University where in 1971 he received a B.S. degree in physics. He went on to study physics at MIT, where he specialized in quantum electronics and laser technology, completing his Ph.D. in 1977. As a student he performed some of the earliest work on chemical HF/DF and high pressure CO lasers, publishing pathbreaking scientific papers on the subject. McNair was also a physical fitness advocate and pursued athletic training from an early age. He was a leader in track and football at his high school. He also became a black belt in Karate, and while in graduate school began offering classes at St. Paul’s AME Church in Cambridge, Massachusetts. He also participated in several Karate tournaments, taking more than 30 trophies in these competitions. While involved in these activities McNair met and married Cheryl B. Moore of Brooklyn, New York, and they later had two children. After completing his Ph.D. he began working as a physicist at the Optical Physics Department of Hughes Research Laboratories in Malibu, California, and conducted research on electro- optic laser modulation for satellite-to-satellite space communications. This research led McNair into close contact with the space program for the first time, and when the opportunity presented itself he applied for astronaut training. In January 1978 NASA selected him to enter the astronaut cadre, one of the first three African Americans selected. McNair became the second African American in space between February 3 and 11, 1984, by flying the Challenger Shuttle mission STS-41B. During this mission McNair operated the maneuverable arm built by Canada and used to move payloads in space. The 1986 mission was his second Shuttle flight. Gregory B. Jarvis, a payload specialist, worked for the Hughes Aircraft Corp.’s Space and Communications Group in Los Angeles, California, and had been made available for the Challenger flight by his company. He was born on August 24, 1944, in Detroit, Michigan. Jarvis had been educated at the State University of New York at Buffalo, receiving a B.S. in electrical engineering (1967); at Northeastern University, Boston, where he received an M.S. degree in the same field (1969); and at West Coast University, Los Angeles, where he completed coursework for an M.S. in management science (1973). Jarvis began work at Hughes in 1973 and served in a variety of technical positions until 1984 when he was accepted into the astronaut program under Hughes’ sponsorship after competing against 600 other Hughes employees for the opportunity. Jarvis’ duties on the Challenger flight had revolved around gathering new information on the design of liquid-fueled rockets. 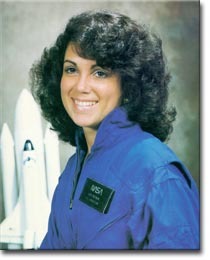 Judith Resnik was one of three mission specialists on Challenger. Born on April 5, 1949 in Akron, Ohio, the daughter of Dr. Marvin Resnik, a respected Akron optometrist, and Sarah Resnik. Ms. Resnik was educated in public schools before attending Carnegie Mellon University, where she received a B.S. in electrical engineering in 1970, and the University of Maryland, where she received a Ph.D. in the same field in 1977. Resnik worked in a variety of professional positions with the RCA Corporation in the early 1970s and as a staff fellow with the Laboratory of Neurophysiology at the National Institutes of Health in Bethesda, Maryland, between 1974 and 1977. Selected as a NASA astronaut in January 1978, the first cadre containing women, Resnik underwent the training program for Shuttle mission specialists during the next year. Thereafter, she filled a number of positions within NASA at the Johnson Space Center, working on aspects of the Shuttle program. Resnik became the second American woman in orbit during the maiden flight of Discovery, STS-41D, between August 30 and September 5, 1984. During this mission she helped to deploy three satellites into orbit; she was also involved in biomedical research during the mission. Afterward, she began intensive training for the STS-51L mission. Michael Smith was born on April 30, 1945 in Beaufort, North Carolina. 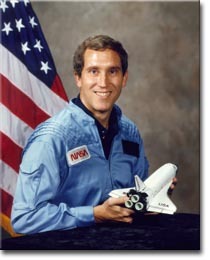 At the time of the Challenger accident a commander in the U.S. Navy, Mr. Smith had been educated at the U.S. Naval Academy, class of 1967, and received an M.S. in Aeronautical Engineering from the Naval Postgraduate School in 1968. From there he underwent aviator training at Kingsville, Texas, and received his wings in May 1969. After a tour as an instructor at the Navy’s Advanced Jet Training Command between 1969 and 1971, Smith flew A- 6 “Intruders” from the USS Kitty Hawk in Southeast Asia. Later he worked as a test pilot for the Navy, flying 28 different types of aircraft and logging more than 4,300 hours of flying time. 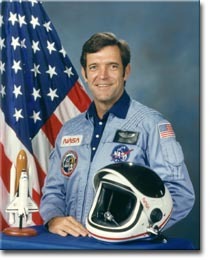 Smith was selected as a NASA astronaut in May 1980, and a year later, after completing further training, he received an assignment as a Space Shuttle pilot, the position he occupied aboard Challenger. This mission was his first space flight.